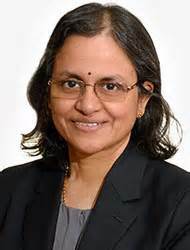 Dr. Sudha Seshadri is a Professor of Neurology at Boston University School of Medicine and a Senior Investigator at the Framingham Heart Study. She also serves as Co-Director of Medical Education for the Neurology Residency and Clerkship programs. Sudha attended medical school at the Christian Medical College of Madras University in India. Afterwards, Sudha completed residencies in Internal Medicine and Neurology at the All India Institute of Medical Sciences in New Delhi. Fellowship in the Neurobiology of Aging and Alzheimer Disease at the University of Massachusetts Medical Center. Sudha previously worked as an Assistant Professor of Neurology at the All India Institute of Medical Sciences. She also completed a residency in Neurology at Boston University School of Medicine and she joined the faculty at Boston University in 2001. Sudha is the recipient of the E. Merck Gold Medal in Neurology and Allied Sciences, the Jack Spivack Excellence in Neurosciences Research Award from Boston University, and she is also a Member of the Alpha Omega Alpha Medical Honors Society. Sudha joined us for an interview to discuss life, science, and medicine. Sudha’s work is a big part of who she is and her purpose in life, but when she’s not at work, she loves to read. She has been an eclectic reader since she was a kid, devouring everything from poetry to novels and nonfiction. Reading has been an escape, a way to get information, and a source of inspiration. Sudha occasionally writes her own poetry as well. In addition, she likes to spend her free time walking, trekking, going for short runs, and being a parent to her daughter. She divides her time at work between being a clinical neurologist who sees patients with memory problems and being a researcher. In her research, Sudha is trying to determine why the brain and cognitive function decline with age, and what modifiable factors determine this decline, with the hope of better predicting and preventing it. She is able to leverage robust data sets from the Framingham Heart Study that began studying a cohort of people in 1948 and started collecting information related to dementia in 1974. Sudha believes that there are many different pathways that lead to dementia. She hopes in the future to be able to stop the progression of the disease and convert it to a chronic and manageable illness. When Sudha was about 5 years old, her mother fell ill with a neurological disease, so Sudha spent much of her childhood visiting her in the hospital. Seeing her mother change over the years sparked passion and a sense of purpose in Sudha to understand the brain and become a physician. In high school, she toyed with the idea of studying physics because she found it intellectually fascinating, but with her father’s encouragement, she ultimately chose to pursue biology to become a physician. Once Sudha committed to medicine, she really enjoyed it. When it came time to specialize in medical school, she had to choose between neurology and neurosurgery. While she liked neurosurgery, the broader scope of neurology won out in the end. Sometimes failures and challenges can redirect your life in good ways. Initially, Sudha had her heart set on doing neurology at a particular institution, but she ended up not getting accepted there. Instead, she accepted a position at another institution where she happened to meet the man who would become her husband. They have raised a wonderful daughter, and everything turned out well. Sudha was also sure she would stay in India after completing her neurology training there, but her husband really wanted to study cardiology in the U.S. with the Framingham Heart Study. They decided to move to the U.S. together with their three year old daughter, and Sudha started a fellowship there. Sudha enjoyed working with the participants of the Framingham Heart Study and had excellent mentors. She had to make a difficult choice between becoming a full-time researcher or taking time out to do another residency. Though choosing the residency set her research career back about four years, she wanted to be able to treat patients, she is a better neurologist because of this extra training, and she is able to take her clinical questions into the research realm to find the answers. Last year they reviewed data from the Framingham Heart Study over the past 30 years, and they discovered, somewhat surprisingly, that a person’s risk for developing dementia at a given age was going down. The average age at which a person develops dementia has increased from about 80 years old in the 1970s to about 85 years old today. These trends are exciting, and they are following up to understand why this is occurring. Another success for Sudha has been the exceptional mentees she has worked with over the past 10 years. One of her first mentees heard her speak at a meeting and asked afterwards if she could join Sudha’s lab. Sudha didn’t have funding at the time, and she barely had a lab. They submitted a Fullbring Fellowship application, and it was funded! Within five years after leaving Sudha’s lab, this individual is now a full professor and a valuable colleague. It has been a joy to see her mentees go on to do great things and to know that she can make a substantial impact through mentoring and collaborative science. Paris and Bordeaux are among Sudha’s favorite cities she has visited. One of Sudha’s former mentees is from France, and she has become one of Sudha’s treasured colleagues. This individual showed Sudha around Paris the first time she was there, and Sudha absolutely loved it. It was fun to watch the people, walk by the river, and take in the sense of history of the city. Paris was beautiful, and the food was great. While Sudha didn’t used to have a particular interest in food, travel has sparked her appreciation for good food and wine. Now Sudha likes cooking for her husband and her daughter when she visits. When she travels to different cities with her collaborators, they have fun going out to dinner together and catching up. It is also nice for Sudha to see some of her younger colleagues developing friendships and having fun together at conferences. They are doing exceptional research and putting in a lot of work, but funny things inevitably happen when they get together. At one conference in Toronto three of her colleagues were excited to have a room on the 36th floor with a spectacular view. However, when the electricity went out during their stay, they had to earn their view by climbing 36 flights of stairs at the end of a long day. Also, the French are sometimes given a reputation of being laid back and not working as many hours, but none of Sudha’s French colleagues fit this stereotype. Life happens along the way, and we decide how our lives will progress by our choices, actions, and everyday decisions. Sometimes life takes you to wonderful places you didn’t realize you would ever go. Dementia is part of the journey in life for many people. Though dementia can be tragic, it isn’t entirely about losing things. In some cases, gifts can emerge that are a source of joy. For example, some people with dementia go through a phase of extreme visual and musical creativity as they lose their language abilities. Look for the little gifts in this tragic process. Also, remember that we all need to work together in this world. So much progress has been made, and we can hardly imagine how much more capable of managing disease we will be in the next 50 years. Sudha has published 300 papers on risk factors and genes for stroke, Alzheimer’s disease, and brain aging. She leads several international genetic collaborations, reviews papers, and grants, and she enjoys teaching and mentoring students and young researchers from all over the world. In recent years, she has been fortunate to travel to many countries and learn from a diverse group of colleagues with whom she also works through long conference calls and webinars. Professionally, her goal is to integrate population neuroscience with clinical care and research, as well as laboratory based biological research, to identify effective prevention and treatment strategies for Alzheimer’s and other dementias. She considers it the greatest privilege of her life that she gets to be a part of so many lives. Her hunch is that what we call Alzheimer’s dementia is an end-result of many biological pathways, and understanding which specific patients will respond to a specific treatment will let us help more people. Her dream is, in her lifetime, to change Alzheimer’s disease from an inexorably progressive curse to one where progression can be largely arrested, and at least in some persons, memories lost can be retrieved. Personally, Sudha is a proud and lucky mother, wife, sister, aunt, daughter, and friend. She wishes she had more time to read poems and books and write long-form letters, and she treasures the opportunities she gets.